The Project Kics R40 Lug Nut is made of SCM435 Alloy for light weight and high strength. The M12×1.50 and M12×1.25 thread pitch REVO comes in either Black Chrome or NeoChrome and features two-piece construction with the floating seat design. This allows you to properly torque your REVO Lug Nuts on your wheels without marring the finish. The REVO also features a black high-endurance resin cap for a cleaner, closed ended lug nut. 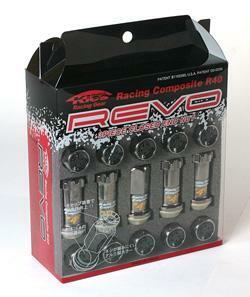 The REVO Locking Lug Nut Sets come in packs of 20 in 16 standard 17mm hex lugs with 4 locking lugs. You can also purchase optional REVO Caps, which are perfect for those who think the black caps are too plain or don’t match their car’s style. These plastic caps simply snap in once you pop out the original black caps off of your REVO nuts. These red and blue caps are made of a high-endurance resin and will only work with REVO Lug Nuts.